Those eager to capture a slice of Apple's early history will soon have the chance to bid in an auction for the company's first official signage and a toolbox belonging to one of its co-founders, both of which are estimated to command a high bidding price. Of the items up for grabs through auction house Alexander Autographs, the most significant is the very first trade sign for "Apple Computer Inc." ever used by the company now famous for its Macs, iPhones and iPods. The 100-inch Plexiglas sign was one of the first public displays of Apple's now-famous rainbow logo and was reportedly first used in a lit display at the first trade show ever attended by founders Steve Jobs and Steve Wozniak in late 1976, when the company had the Apple I as its only product. It also served as the company's logo on various buildings until a more elaborate, permanent fixture was ready. "That sign hung for over one year in front of the 10260 Bandley Dr. location, then in front of one of our two Bubb Rd. buildings," says early engineering worker M. Thomas Liggett Jr., who is selling both of the auction items. "When Steve Jobs' brass sign turned out not to be what was hoped for... [it] went back up... until the then new-style redwood sign arrived." Liggett had asked to hold on to the sign as a keepsake when it was finally replaced and has held it since. That move may prove fortunate at auction: Alexander Autographs estimates that final bids will come in between $15,000 and $20,000, either of which would sit well beyond its initial value. Apple's original trade show sign. A more personal connection comes from Steve Wozniak's toolbox. 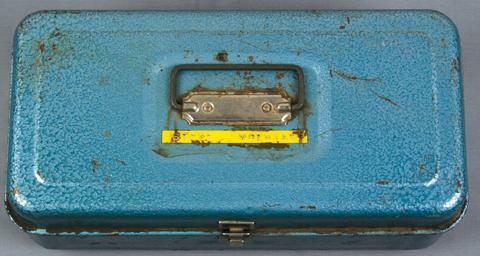 The rusted, scratched blue kit was also saved from the scrap heap by Liggett Jr. and was a company-issue toolbox given to Woz and other employees sometime before 1978. While it's hard to date the box, Alexander reckons that the box may have been given to Wozniak not too long after the company's 1976 founding. And while the co-founder had left the toolset to the side out of lack of interest, it like the sign should carry a premium with its historical significance: Alexander believes the box should result in a bid between $3,000 and $5,000. The auction will take place between November 6th and 7th and is due to include other historic relics ranging from a signed photo of Oskar Schindler to General and Enola Gay pilot Paul Tibbets' flight suit worn when he dropped the first atomic bomb. One of Steve Wozniak's early toolboxes.